Note: This message is intended for mature Christians well along in their walks with God, not for new believers or for seekers. Understand that when reading. Thank you. 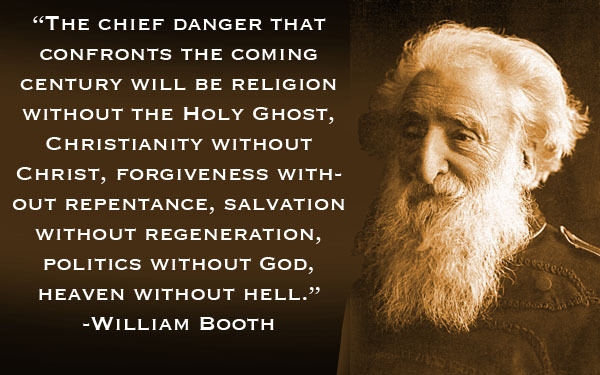 William Booth said, "I consider that the chief dangers which confront the coming century will be religion without the Holy Ghost; Christianity without Christ; forgiveness without repentance; salvation without regeneration; politics without God; and Heaven without Hell." When I first read that quote from the founder, I thought to myself: Yeah, I mean, kinda, some of that is probably true, but William, that’s just too much. It’s grating on my ears. I don’t like to hear about hell, it makes me feel yucky. Don’t talk about repentance, just talk vaguely about repenting. And so on… and today I think to myself when I read that: Dead on. Exactly right. But not here, not now, not amongst us, on campus, as cadets and leaders. We will be set aflame by the Holy ghost. We will preach Christ. We will teach true repentance. We will talk about heaven and hell. Today we’re looking at Acts 2, where we find a great example of full gospel minister, in the apostle Peter. Peter preached his first message on this day, recorded in Acts chapter 2, on the day of Pentecost, when the Holy Spirit came. Many of you here will be Peters going out into the field, to begin your service to Christ. And the rest of us will go out to our summer assignments to do the same. Don’t let it ever be normal friends. This is special what we do. Peter preached boldly to the crowds on that day, and 3000 new believers were won. But they weren’t won by him. They were won by that Holy Spirit within him, and that Spirit in the people. It says they were cut to the heart by the message. They were disturbed, and roused from their antipathy to action/change. That change was wrought by the Spirit. It's time to go deeper with the Lord. Ask the Lord in prayer, on your knees, "Lord, go deeper into me. You've done a mighty work thus far. Now go much deeper into my soul and change me in deeper, more thorough way." When we go deeper with God, and honor Him in doing His will, not our own, He will respond in ways we can't imagine. We can’t fear God though, we really can’t. Only the Holy Spirit can teach us that. So ask the Holy Spirit for wisdom here. Cry out to Jesus again and again, stubbornly, endlessly, for freedom from every sin in your life. Jesus will help us. He will set us free from every chain. Don’t give up, keep fighting! It’s so tough some days, when my body cries out for something, anything that would feel good, even for a moment. But stand firm in the Spirit, which is obeying the will of God. Each day we wake up in the flesh, and our default is to do things in our own human effort. Instead, shift over to the Spirit-life. Live out of the power and guidance of the Holy Spirit, truly doing his will. 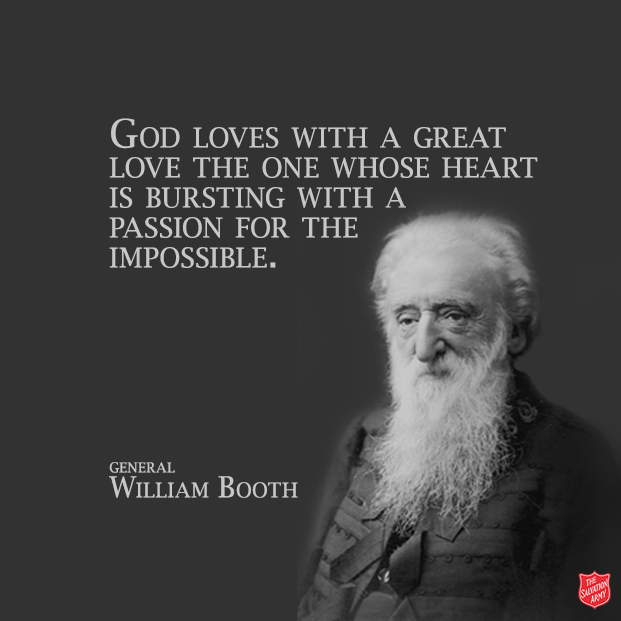 You’re here at training college, which means you’ve begun to obey God, you care deeply about doing God’s will and not your own. Keep doing that, in every corps program, in every decision you make in the field, double-check it with God. Seek His will for your corps first. Temptations will come and assault us deeply. Sexual temptations will come. Satan will offer up affairs to destroy our marriages, and controversies to test our resolve. Lusts of the flesh will come. Pride will come and attempt to destroy all our work for Christ. And many fall to those temptations. But put on that strong armor of God, to stand against every attack of the enemy. Spiritual warfare is a reality. And we are target number 1 of Satan our enemy, who wants to destroy and subvert the church. Fight back with the weapons of faith. We have great and mighty works to do in the world. We have a great awakening to lead in the central territory. We can’t afford anything holding us back! Be holy as He is holy. We will succeed, I believe that, in Jesus name. We can do all things through Christ who strengthens us. Why? Because Jesus meets us on the way. When Peter fell short, denying Christ, he was afraid and falling apart. Jesus did not leave him there. Jesus came to him, and invited him to repent. Peter’s response was true repentance. And what came as a result of that decision? Peter became a great leader of the church, as He preached boldly, on the day of Pentecost, preaching about the life, death, and resurrection of Christ. And the Spirit was with him completely, ministering through Him, and 3 thousand were saved. Christ calls us to the same task today. And we will do it. Should I Tithe 10% to my Church?